The 'flattened' caps are probably ceramic disc capacitors. Probably for the trem circuit. Hate to say it but you are going to have to draw a layout diagram. The two black .022uf caps on the right side are coupling caps non-polarized and the stripe indicates foil side. The single black .03uf is coupling cap non-polarized stripe indicating foil side. 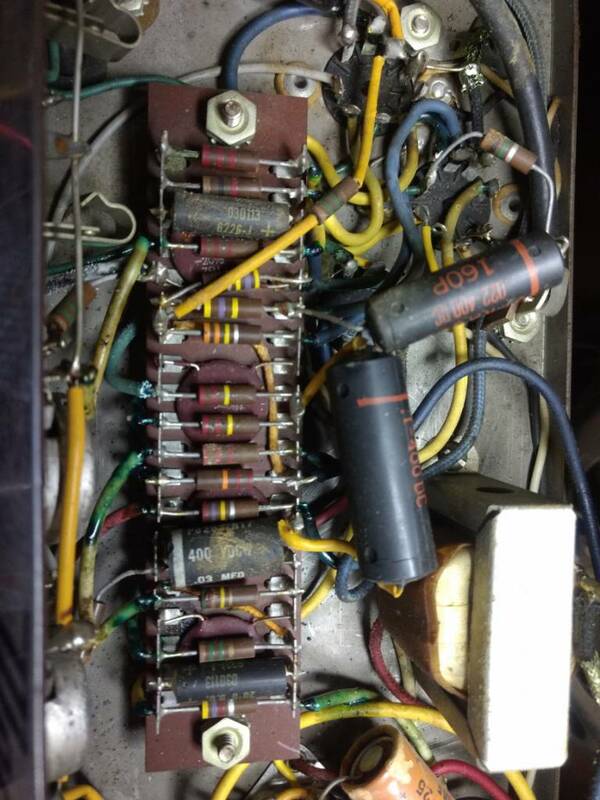 The last two caps are polarized electrolytic caps, not sure value, but they might be cathode bypass capacitors. On those electrolytic caps what does each end connect to? Thanks for the info and steering me on this Dr. G.... so the polarized electrolytic caps at the top and bottom of pic are both 20uf--I traced them to cathodes of respective tubes and they are, indeed, cathode bypass caps. the middle cap, .03uf, is a coupling cap belonging to tremolo circuit. Now, when replacing these non-polarized caps I'm a little thrown off with "stripe indicates foil side down." With modern non-polarized caps we don't have to think this way? Correct? Either end will do? "Now, when replacing these non-polarized caps I'm a little thrown off with "stripe indicates foil side down." With modern non-polarized caps we don't have to think this way? Correct? Either "
There no longer is a marked 'foil side'. Non polarized coupling caps should have the outer foil side connected to the low(est) impedance side of the circuit. Modern caps are not usually marked "foil side". Great articles. I had no idea. Learning a lot.Thank you! Under the resistors are 4 ceramic disc caps that have been flattened. I would have to remove the resistors to get at these caps to check them...do these have a history of failing? They are old...also anyone suggest a good pair of long skinny snips to snip these resistor leads? Under the resistors are 4 ceramic disc caps that have been flattened. I would have to remove the resistors to get at these caps to check them...do these have a history of failing? The opposite is probably true. The ceramic disc type caps are highly reliable and maybe the least likely type of cap to fail. I would leave them as is. Thanks g1... I'm relieved hearing that. And they are not "flattened" , they are that shape from the beginning. They are basically a thin ceramic disk with metallized faces.